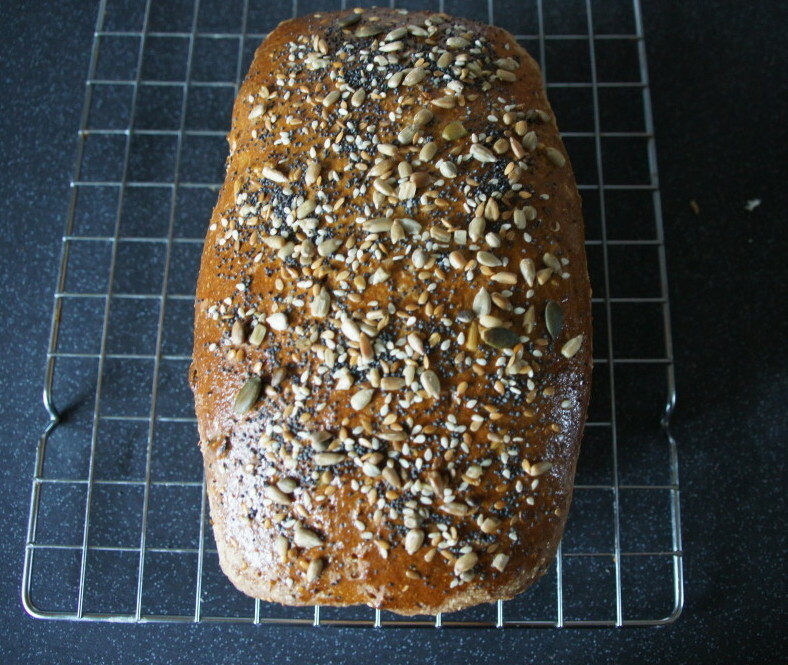 This recipe uses wholemeal and spelt flour to allow for a lighter texture. It does have quite a dense texture and doesn’t rise particularly high – it makes good toast (topped with a poached egg as I had for my lunch today). You will need a 900g loaf tin. It will need one hour to rise before knocking back and then rising again or alternatively you can prove it in the fridge overnight which is what I did. Just make sure you allow it come back to room temperature for 45 minutes – 1 hour before knocking it back and adding the seeds. 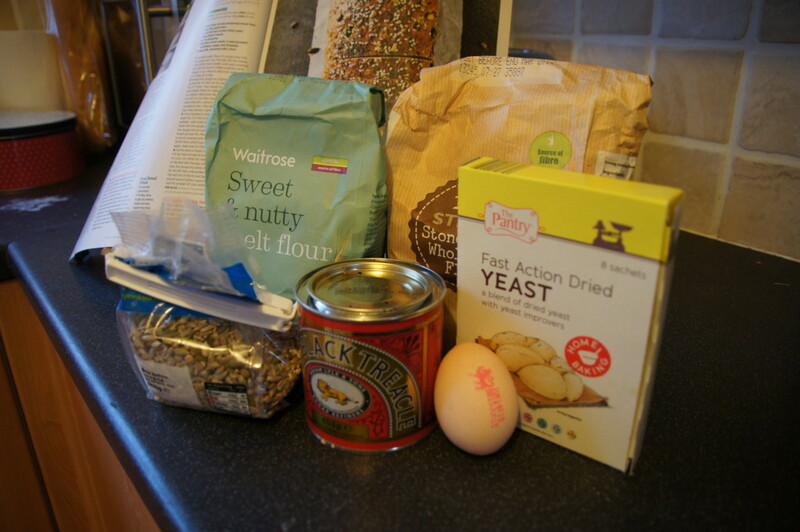 2) Knead the dough on a lightly floured surface for 10 mins (or in a tabletop mixer for 5-7 mins). Your dough should be smooth and elastic when it’s ready. Place the dough in a lightly oiled bowl, flip the dough over to coat it in oil, then cover with a sheet of oiled cling film. Leave in a warm place until doubled in size – this will take about 1 hour (or alternatively leave it in your fridge overnight). Lightly oil a 900g loaf tin (if cooking straight away). 3) Once doubled in size, knead the dough again for 3-5 mins to knock out the air bubbles – add most of the seeds and work these into the dough as you knead. Shape the dough into an oval roughly the same length as your tin. Place in the tin and leave to prove, covered with oiled cling film, for 30-45 mins until it has nearly doubled in size again. Heat oven to 200C/180C fan/Gas 6. 4) Gently press a finger into the loaf to check if it has had enough proving time (if it bounces back it can be left to prove a little longer, if it the indentation doesn’t move it’s done). 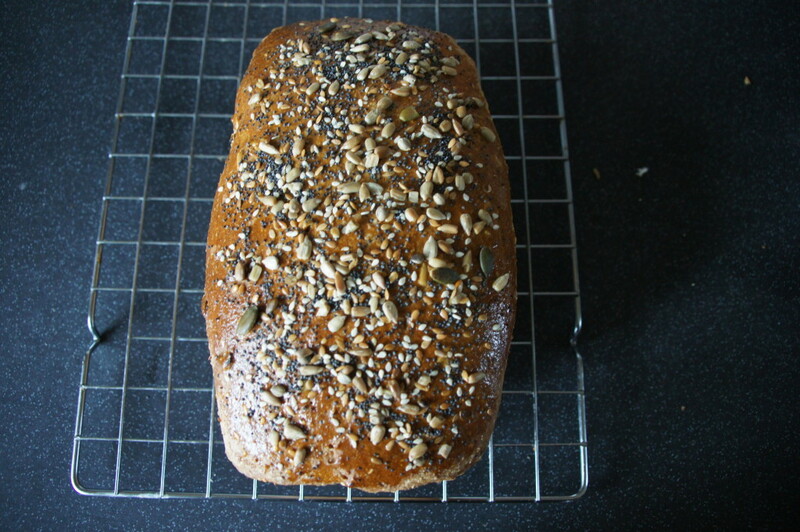 When it’s ready, glaze the top of the loaf with the egg yolk and sprinkle over the remaining seeds. 5) Bake in the oven for 40-45 mins until golden brown – if you tip the loaf out of the tin and tap the bottom, it should sound hollow. Leave to cool on a wire rack for at least 30 mins before slicing.